Remember I mentioned not so long ago that, in Paris, you could throw a coin somewhere and you’d probably hit a monument? Something along that line anyway. Well, I found out today that if I walk back to my new place from across the road as opposed to the side I usually take, I am treated to a beautiful view of the Eiffel Tower. If it’s on the hour after sunset, then the tower is also sparkling pretty. Not much is going on otherwise. I haven’t been feeling well for a good few days now, and the grey grey sky outside that’s on feature a lot lately is not helping much. I hope this is not going to be all that I have to look forward to for the next 2-3 months or it is going to send me straight to the world of winter blues. 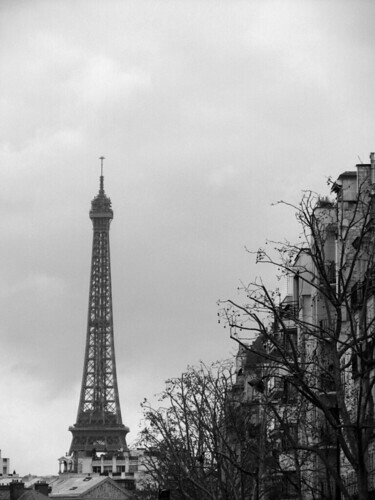 Paris, I’m counting on you to keep me amused and happy!